Made from the simplest of supplies, these DIY coasters are something to toast about. Grab your favorite hankie and get started on a sweet craft that will bring a bit of cottage living to your flea market decor. This coaster is as clever as it is easy to make. 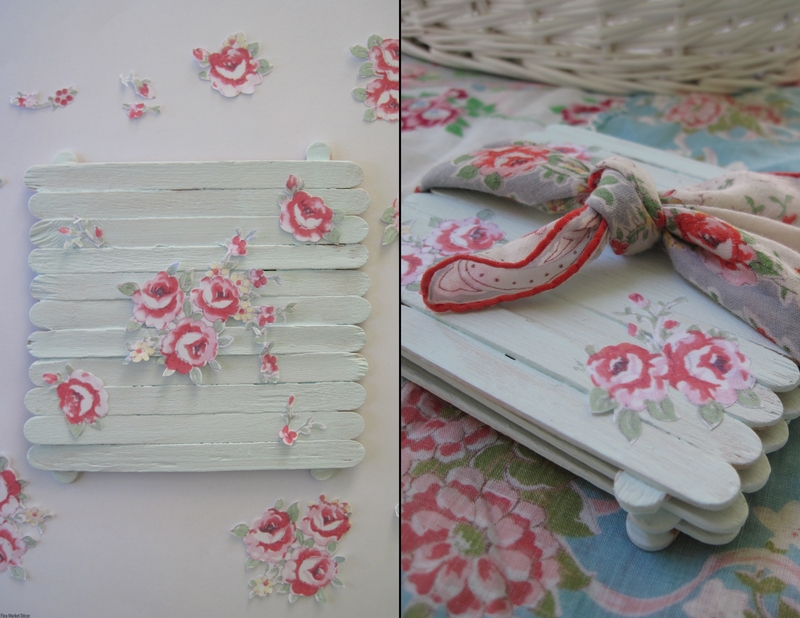 Bring a little spring to your day with these DIY delights! 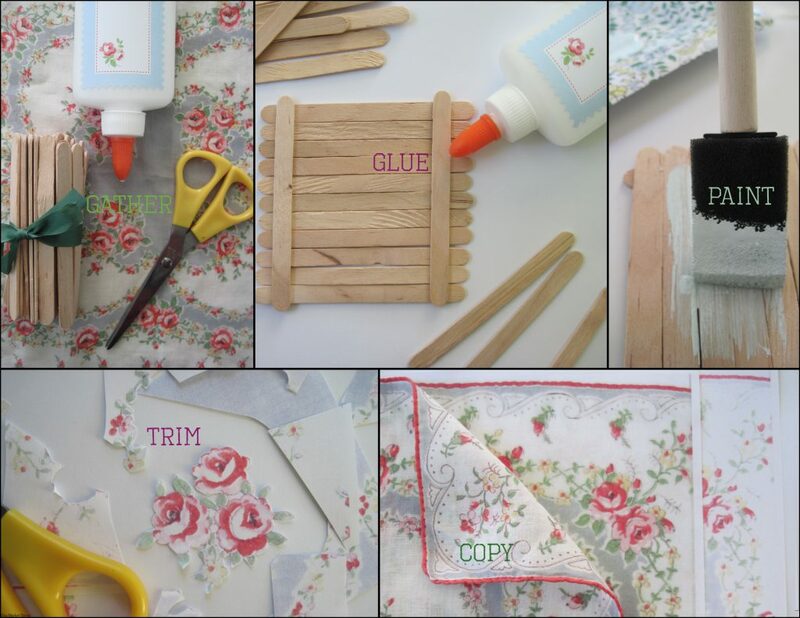 Assemble small squares from craft sticks and decorate them using handkerchief details you copy to paper and glue onto coasters in the form of picket fences. Keep them handy at home or give them as a gift—tied with a handkerchief, of course. Bring a vintage handkerchief to a copy/office-supply store to make color copies. Lay handkerchief flat and copy as-is or experiment with settings such as reduce/enlarge, light/dark, etc., until you have motifs in the size and shade you prefer. Carefully trim motifs from your handkerchief paper. Use scissors or a utility knife meant for crafting. Set aside motifs. Lay 11 craft sticks side-by-side in a neat and even row. Draw a light line of glue across the top and bottom of the row, leaving small margins; place one craft stick gently but firmly on each line of glue to hold the row of sticks in place. Allow to dry. Flip your craft-stick square. Cover the flat top using craft, latex or spray paint. Allow to dry. Determine where you would like to place the paper motifs on your craft-stick square and adhere pieces using a light brushing of decoupage medium on their reverse sides. Press images gently to the craft-stick square making sure to work with the grooves. Allow to dry. Once your craft-stick square is decorated to your liking, lightly brush the entire top surface with decoupage medium, smoothing any wrinkles as you work. Apply multiple coats (allowing dry-time between) to waterproof each coaster. Your completed coasters will make a delightful accent to your flea market decor. Tip: If you don’t enjoy intricate trimming, use a pretty sticker or water-slide decal instead. Elyse Major is the author of Tinkered Treasures, 35 Simple Projects to Bring Charm to the Everyday, published by CICO Books. Elyse lives in Rhode Island with her husband and two boys. Visit Elyse’s blog at tinkeredtreasures.blogspot.com. This entry was posted in Decor Inspiration, Repurpose It and tagged cottage, cottage living, craft, DIY, DIY home decor, easy DIY, flea market, Flea Market DÃ©cor, how to, repurpose, vintage, vintage decor, vintage style by Flea Market Decor. Bookmark the permalink. DIY Home Décor Ideas: Video and step-by-steps with creative projects that will help you transform your home with flea-market finds. Reader Home Tours: Beautiful interiors and yards submitted by our readers who want to show of their flea-market style. Collector's Guides: Whether you adore Jadeite or jewelry, Pyrex-or pre-war industrial design, you'll find something here in our guides to popular collectibles. In the meantime, sign up for our email list to receive updates and design inspiration!